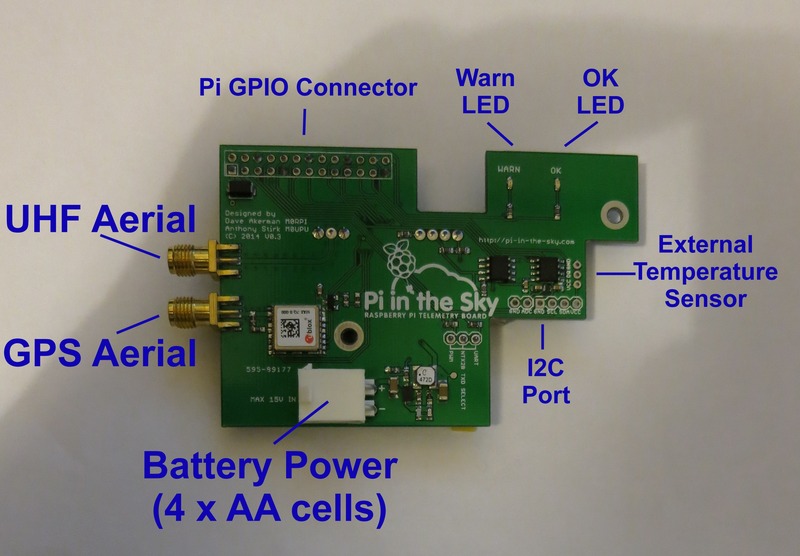 This page shows how to connect the Pi In The Sky board to the Pi and the outside world. UHF Aerial - The kit includes an "SMA Pigtail" from which you can make a simple but very effective aerial. See http://ukhas.org.uk/guides:payload_antenna. The aerial should be at the bottom of the payload. GPS Aerial - This is included. The GPS aerial should be at or near the top of the payload, with nothing (except insulating foam) between it and the sky. In particular, keep cameras away from the aerial. Battery Power - A cable is supplied. For testing you can use standard alkaline cells, but for the flight you must use Energizer Lithium cells. You can also test using a normal 5V PSU connected to the Pi power socket. I2C Port - This allows the connection of external I2C devices (e.g. 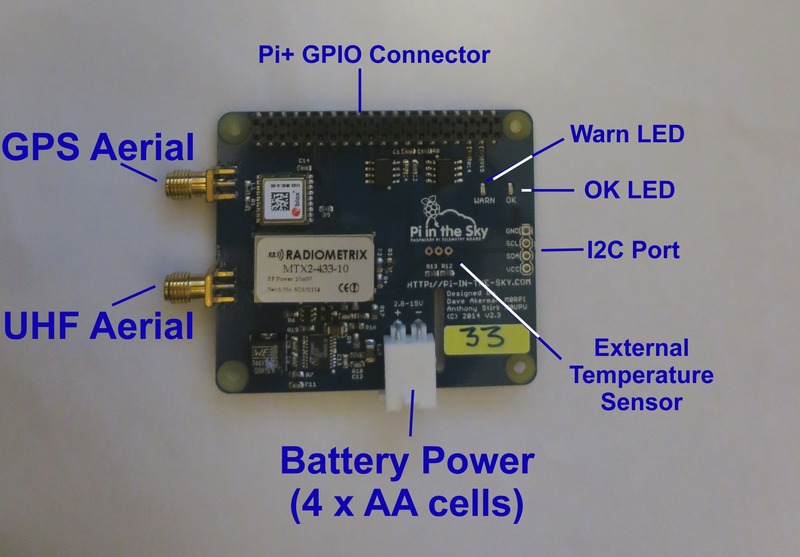 http://www.pi-in-the-sky.com/index.php?id=adding-a-pressure-sensor). We supply code for the BMP085/180 pressure sensors, but any other sensors would require you to write your own code. External Temperature Sensor - Available to connect a extra DS18B20 temperature sensor to the board, usually to measure the external air temperature. OK LED - flashes when GPS is getting a position lock; solid when it has obtained one. Warn LED - flashes when GPS has no lock and no time. The amount of time taken to gain lock depends on how visible the sky is from the GPS antenna, and can be several minutes especially if indoors. Pi GPIO Connector - plugs into the Pi. Take care to make sure it is aligned correctly! Description as above. Note that this board is stackable and comes with a separate pin header adapter that goes between the Pi board and the Pi In The Sky board.